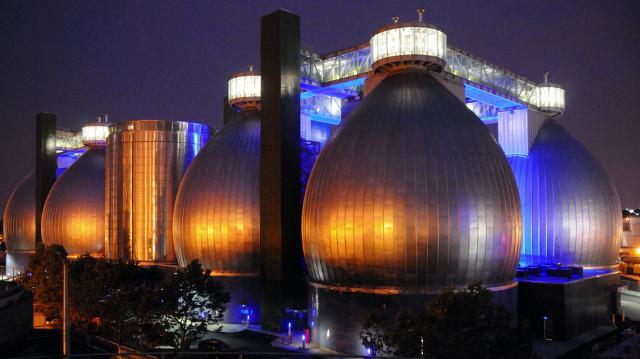 A Brooklyn waste treatment plant has become an unlikely lab for an ambitious effort to turn millions of tons of food scraps from New York City’s apartments and restaurants into renewable energy. Every year, Americans send millions of tons of food to the landfill. What if you could use all of those pizza crusts and rotten vegetables to heat your home? That’s already happening in one unlikely laboratory: the Newtown Creek Wastewater Treatment Plant in Brooklyn. In this case, the gas is methane, which can be used to heat homes or make electricity. Right now, what these bacteria re digesting is mostly sewage sludge. But they’re being introduced to a new diet: food scraps. The hope is that this plant will soon take in hundreds of tons of organic waste from houses and apartments. “Rather than paying millions of dollars to send it to landfill, we could be taking all of Brooklyn’s organics to the Newtown facility and converting it into clean renewable energy,” says Ron Gonen, New York’s Deputy Commissioner for recycling. The Newtown facility is an example of anaerobic digestion, which is not a brand new idea. What is new is the idea of adding food waste in to the mix. Past-prime produce, rotten tomatoes, fats, oils, greases from fryers, past-prime dairy products and loaves of moldy bread are all great food-stuffs for anaerobic digestion. The problem lies in the complexity of implementing a food waste system in New York City because of its huge quantities of waste. One challenge is the amount of extra work it would be to separate the organic material from the rest of the trash in a city as dense as New York. Another challenge is that the Newtown Creek facility can only handle a small fraction of what is coming in. The costliest part will be finding enough locations to build more facilities to handle the volume. Still, this is a great first step. This entry was posted in News and tagged Anaerobic Digestion, Diversion From Landfill, Newton Creek, Renewable Energy on March 14, 2014 by BioHitech America.